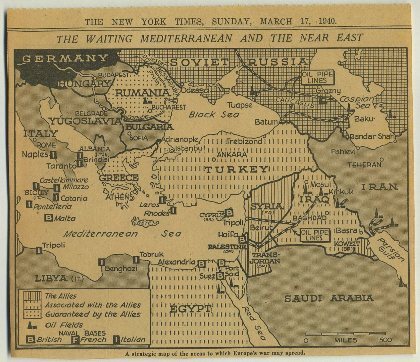 You are here: Home / News - Notes / Ephemeral Forgotten Bookmarks: Newly Popular or Just Gaining a Little Attention? Ephemeral Forgotten Bookmarks: Newly Popular or Just Gaining a Little Attention? 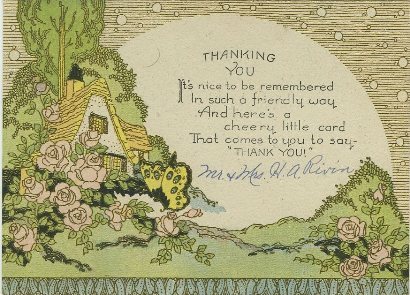 This past summer Mary Weil posted a story about forgotten bookmarks over on his widely read ephemera blog. The post talked about Michael Popek, a used and rare bookseller in Central New York who came across so many neat items marking the pages inside books that he started his own entertaining site under that very name, Forgotten Bookmarks. 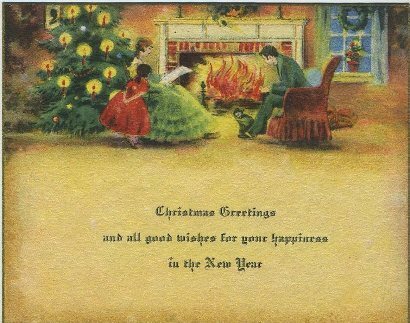 Wonder if they waited until after Christmas before tucking this greeting card in between their pages. Just today I came across an article by Graceann MacLeod on Wordworth.com titled Unexpected Literary Treasures. In her well written piece Ms. MacLeod talks about her fascination with more traditional bookmarks before moving into a section called "Accidental Ephemera" that talks about ephemeral bookmarks as well. Bookmark collectors take note: The Bookmark Collectors Virtual Convention will be held February 20-21, 2010. More to come on this event as we get closer to it. This second article recalled the first to me, and now I feel compelled to admit that I too have found myself loosely collecting ephemeral bookmarks. It wasn't a plan but more of part of the general sickness with me--I can't throw anything away, especially old paper. It doesn't take up much room so why not just create another stack? I don't typically sell books, though I've collected enough myself that I don't believe I'm exaggerating to say I have about two dozen large boxes of (currently) irrelevant titles tucked away throughout my living quarters in addition to those lining the shelves across nearly every imaginable portion of otherwise exposed wall space. Books have yielded some of my collection, though my main source are the vintage magazines I sell. You're quite welcome! Wait, what did I do? But this bibliophile has a dirty little secret, as I'm sure many others do as well. Sure I've got lots of books, in fact I'm confident that unless you consider yourself a book collector or have a job at a university that I have more than you do. Back before I spent so much time online I'd fill bags at fairs and church sales, carry them around book stores til the pile reached my chin, even, ahem, as I once described on Marty Weil's aforementioned ephemera blog, dumpster dived for them. In recent years my gathering has been more controlled, but basically any topic of interest that I bump into ... and that's a lot when you're online all day ... leads to seeking out a used title on Amazon. But the secret? I don't read them all, heck probably not half. Buying on a whim and awaiting delivery often leads to waned interest for one. And back when I was buying by the pound, well, come on, sure I'd read 2 or 3 titles out of an overstuffed shopping bag, but I bought those others just because, well, you never know when you might need them. With old magazines, they're my stock, and so in composing listings for them on eBay and other online venues I take the time to page through each issue. No, I'm not reading them, though I do often become distracted by an interesting headline, but I'm making sure all the pages are there and that they're undamaged. And that's where the bulk of my own stack of ephemeral bookmarks have come. The lovely Miss Camden with her ugly competition at her left. 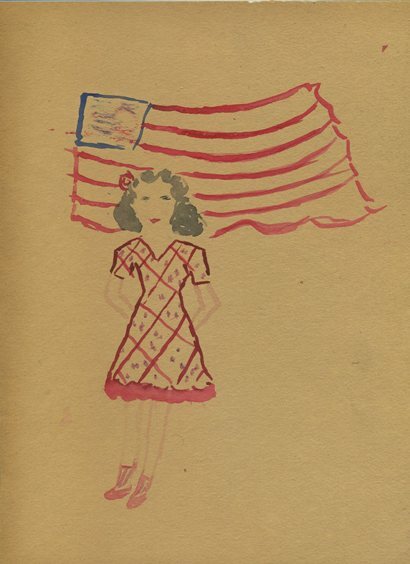 A reserved Miss Camden on Independence Day? Wish that I noted the dates on the magazine issues I pulled these items from. 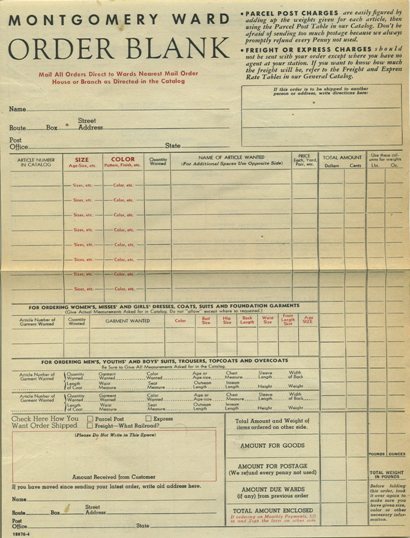 This Montgomery Ward order sheet is likely from the 1930s or 40's if memory serves correct. 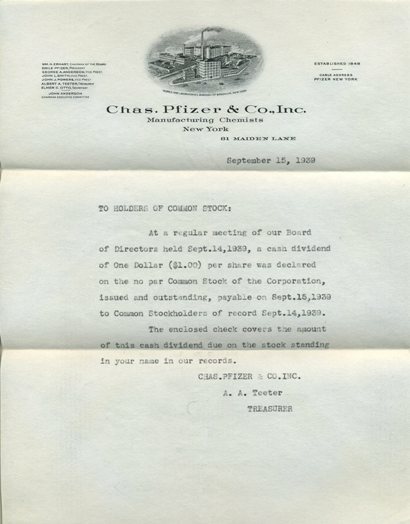 My favorite, a gem mint letter from Pfizer on company letterhead declaring a divident of $1.00 to stock holders. Dated September 15, 1939, I also have the original envelope with company logo. This is a great post. I’ve been collecting book marks, and book plates for a while. I think it’s an underrated area of collecting. 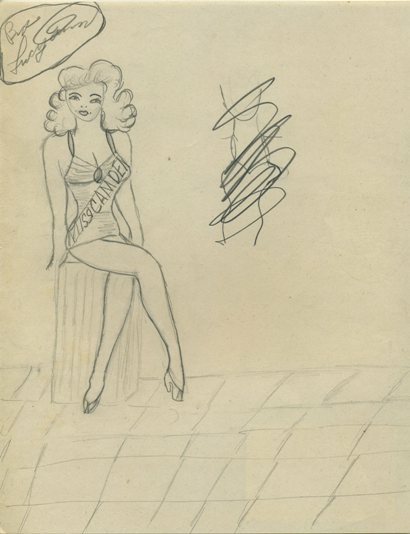 Like other collectilbes, many artists got their start with these items and rare ones will have the first published work of the artist seen anywhere. And as you’ve pointed out, there are a great many surprises tucked into books used for the purpose of marking a page. I sell used and out of print books and I love the things that I find in them. Like you, I just don’t want to throw any of these neat finds away, but I wonder what the heck it is that I’m going to do with them. Don’t want to sell them either. Bookmarks will eventually go the way of the dinosaur with the ever-growing trend of ebooks so I suspect that they will become even more collectible. I tend to use old ticket stubs for bookmarks. It was a treat to discover in a second-hand copy of “Pudd’nhead Wilson” that the previous owner used a ticket stub from a performance in a New Jersey theatre in the 60s of Walter Slezak starring in “Come Blow Your Horn”. We’re obviously kindred spirits.